WILDSIDE IS 10 YEARS OLD TODAY!! 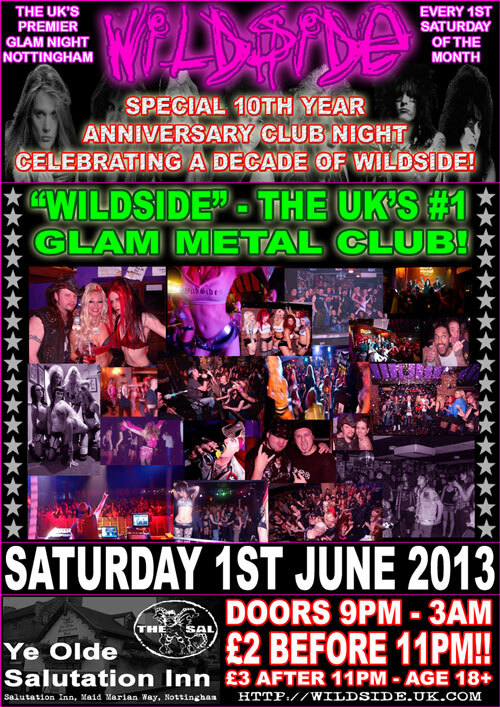 WILDSIDE IS 10 YEARS OLD TODAY!!! Head over to our BIO page for a cool pictorial history of 10 years of Wildside! And we’ll be celebrating a decade of glam, sleaze and hair metal as the UK’s premier glam night and Nottingham’s longest running independant rock night TONIGHT at the Salutation Inn! It’s time to come and PARTY ON THE WILDSIDE once more and sing us happy birthday!! In the main room upstairs you will have DJ (AL) WILDSIDE (Glam/Hard Rock/Cheesy Fun Party Tunes! ).